We will soon push an update of the Suru icon theme that includes more device icons in order to support the Ubuntu convergence story. 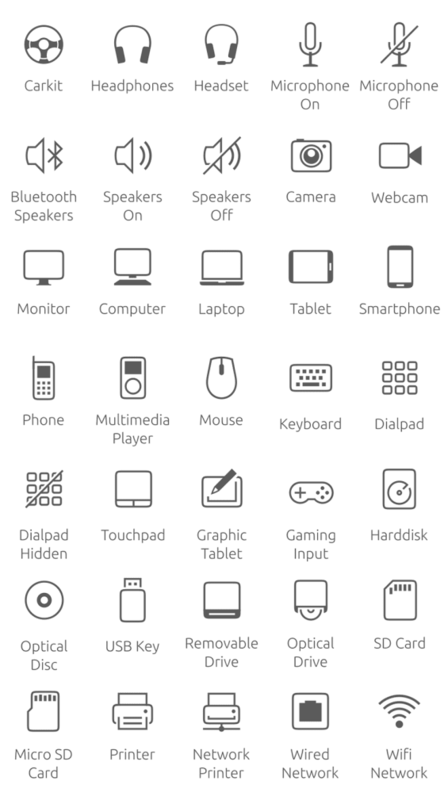 Because the existing icon set was focused on mobile, many of the new icons are very specific to the desktop, as we were missing icons such as hard disk, optical drive, printer or touchpad. When designing new mono icons, we need to make sure that they are consistent with the graphic style of the existing set (thin outlines, rare solid shapes, etc). A device, like a printer or a hard disk, can be quite complex if you want to make it look realistic, so it’s important to add a level of abstraction to the design. However the icon still has to be recognisable within the right context. At the moment, if you compare the Suru icon theme to the symbolic mono icons in Gnome, or to the Humanity devices icons, a few icons are missing, so you should expect to see this set expand at some point in the future — but the most common devices are covered.